This ultra-high quality dual-camera HD-SDI unit integrates a 20x or 30x PTZ camera and a wide-angle panoramic camera, generating two independent HD-SDI outputs, as well as network streaming capability. 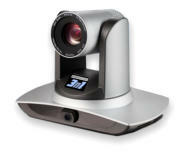 As an added bonus, it also supports video tracking for presentations, lectures, houses of worship and similar venues. 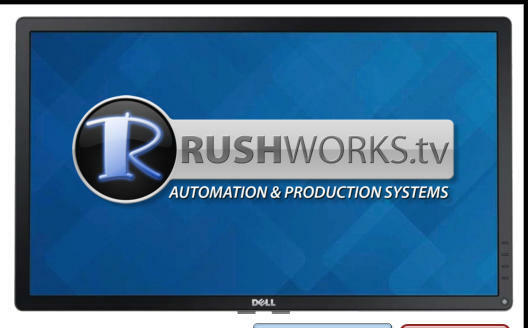 It’s bundled with RUSHWORKS powerfully unique camera control software to deliver the best production bang for the buck in the industry. Key Features • Superb High-Definition Image The 3N1 uses a 1/2.8 inch high-quality CMOS sensor, with resolution up to 1920x1080, and frame rate up to 60 fps. • Advanced Focusing Technology The leading-edge auto-focusing algorithm is fast and consistently accurate. • Low Noise and High SNR The Low Noise CMOS ensures high SNR (Signal to Noise Ratio) of the camera video. Advanced 2D/3D noise reduction technology is used to further reduce the noise, while enhancing image sharpness. • Audio Input Interface The camera supports 16K, 32K, 44.1K, 48KHz sampling frequency and AAC, MP3, and PCM audio coding. • Wide-range, Fast and Quiet Pan/Tilt Mechanism The camera uses high resolution micro-stepper motors, so it’s fast and quiet, ideal for any production environment. • Multiple Video Compression It supports H.264/H.264+ video compression, with resolution up to 1920x1080 and frame rates up to 60 fps, with two channels of 1920x1080p video with 30 fps compression. • Multiple Network Protocol ONVIF, RTSP and RTMP protocols are supported, as well as RTMP push mode. • Low-power Sleep Function There is a low-power sleep/wake up mode that can be active when power consumption is lower than 400mW. Tracking • Advanced Tracking Algorithms The camera uses an advanced human detection and image processing algorithm for accurate tracking. • Anti-Interference Rejection Once the target is acquired, maintaining a lock on the image is possible using masking and other techniques. • Sensitivity and Movement Accommodation Based on the distance to the target, the camera will automatically zoom to maintain target framing. Because the 3n1 has two independent HD-SDI outputs, you can connect them both to a switcher and use the wide angle camera for “cover” shots while the PTZ head is going to presets or being manually controlled. For many meetings and events, simply switching between the two outputs can provide excellent coverage using a single 3n1. 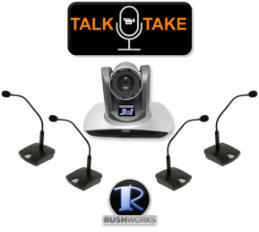 RUSHWORKS’ TALK-TAKE solution, available in VDESK and REMO configurations, supports voice-activated switching. So the PTZ selected on the Preview bus will go to the triggered preset in under one second. While it’s moving, the wide shot will automatically be switched to Program. When the preset is reached, that shot will then automatically switch to Program. It’s fully automated meeting production with just one fixture. No operators required.